Weiβ Schwarz Card of the Day: 15th of October | TCG, shiyo? Now that Rewrite Harvest Festa! 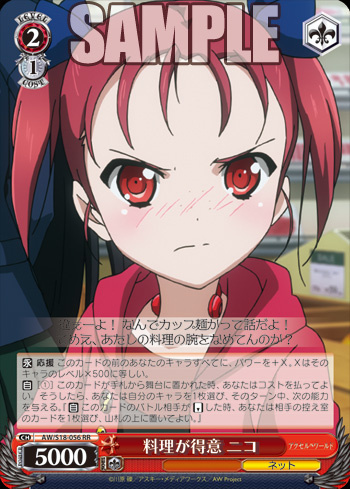 is out, Bushiroad have switched to Accel World for the bulk of their previews. To start things off we have a pair of quite useful Niko cards. [AUTO] When this card is put from Hand to the Stage, you may put the top 1 card of your Clock to the Waiting Room. [AUTO] [(3)] When this card attacks, you may pay the cost. If you do so, deal 1 damage to your opponent. Kozuki Yuniko is a straightforward card capable of both healing and burning. The heal is the standard for a Level 3 when it comes into play. The burn effect is quite costly, since it takes 3 Stock to cause a single damage, but this is because it has no strings attached to it. You simply need to attack and you can cause 1 damage. 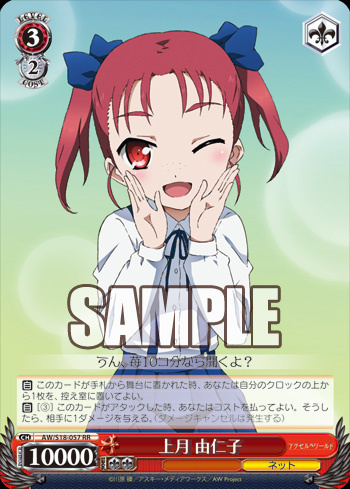 Other burn effects are cheaper, but these tend to involve Climaxes, or defeating characters, so it means Yuniko could be easily fit into any deck. [CONT] ASSIST All of your characters in front of this card gain Power +X. X is equal to that character’s Level x 500. [AUTO] [(1)] When this card is put from Hand to the Stage, you may pay the cost. If you do so, choose 1 of your characters, and it gains the following ability for that turn. [[AUTO] When this card’s battle opponent is put to Reverse, you may choose 1 card from your opponent’s Waiting Room and put it to the top of the Deck. Good at cooking, Niko is yet another Level support card that also comes with a bonus effect, making her useful beyond merely the power boost. As always Level support is very strong, and is something most decks want to include anyway. The second effect essentially allows you to cause an extra point of damage on the turn you play Niko, should you Reverse an opponent’s card in battle. This may mean you’ll want to pick an easy target in order to guarantee the damage, but you might also want to lure out a Counter to make another attack more likely to go through.